Today, we continue with Alfred Wegener and his continental drift theory. Today’s piece will not be pretty. At times, suppression of Wegener’s idea was ugly. There are a lot of reasons for the vilification. He was an outsider, a meteorologist who tried to revolutionize geophysics. His scientific technique was not really science, but seemed to harken back to the age of Aristotle, a time when logical conclusions were drawn from observations without much experimentation. Recent historians have said that Wegener represented a regressive sort of science that was not as open and egalitarian as multiple-hypotheses American science was rumoured to be. Wegener was a World War I veteran who fought on the ‘wrong’ side of the bitterly divisive war, leading to astringent assaults and thinly veiled insults. His uncompromising persistence was interpreted as arrogance. In today’s entry, we’ll review all of this and see why it would take another 50 years before continental drift morphed into plate tectonics and was finally accepted. As we saw yesterday, Alfred Wegener build a strong circumstantial story that the continents move. It was based largely on paleoclimate and fossil evidence. However, there were problems with both his story and his presentation. Wegener had a strong-willed personality, was selective in his choice of examples, had no formal background in geology, and showed little apparent appreciation for the work and traditions of established geologists. Meanwhile, earth scientists pointed out the most serious flaw in Wegener’s grand idea – continents couldn’t be moved by any force weaker than God. He suggested that continental drift was due to tidal action from solar and lunar gravitational forces, but physicists quickly proved those forces were too weak. Wegener had a theory that explained how fossils came to be distributed, but he had no way of explaining how continents themselves came to be distributed. We know now, of course, that convection currents spread oceanic rifts and create subduction zones that move the continents and create and devour crust. This idea had never occurred to Wegener nor to his contemporaries. Scientists who glanced at Wegener’s thesis felt he was arguing that the continents sail around the oceans. A colleague, the respected geologist Franz Kossmat was particularly unconvinced. He had published over twenty geology and mineralogy books and lectured for thirty years in Graz and Leipzig. He is remembered as the first to dismiss Wegener’s continental drift in writing, insisting oceanic crust is too firm for continents to simply plow through. British geophysicist Sir Harold Jeffreys was especially unyielding, certain that the crust’s rigidity made continental drift impossible. His influence was enormous. His disciples denounced Wegener’s hypothesis for decades and lugged Sir Jeffreys’ animosity into fifty years of future debates against plate tectonics. Jeffereys himself lived to 1989, dying at age 98, long after plate tectonics was mainstream – but still opposed the idea. But most European geologists were reserved in their criticism. It was in America that Wegener was most severely berated. American geologists never actually took their fight to the streets, but opposition to continental drift was spirited. 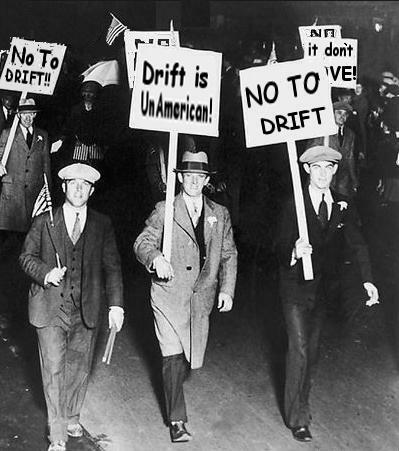 America was the hotbed of anti-drift hostility. Ralph Chaney, an American expert on plant fossils and ancient climates, wrote “It is amusing to note that in taking care of their Tertiary forests, certain Europeans [Wegener] have condemned our forests to freezing.” Chaney dismissed Wegener’s palaeoclimatology as amateurish, apparently unaware that Wegener, with his father-in-law Wladimir Köppen, wrote the world’s primary textbook on the subject. Others, such as Chester Longwell of Yale, rejected the concept of mobile continents in the 1920s and stayed opposed into the 1960s, even as the evidence became overwhelming. In 1968, Longwell sniffed, “Although partisans favoring drift may have been right, they based most of their case on the wrong reasons and were unable to visualize a mechanism.” His statement rings of revisionist history with a touch of sour grapes. To deride the idea, the Americans branded the theory as continental drift, though Wegener referred to his idea as Die Verschiebung der Kontinente, literally, The Displacement of the Continents. By 1928, the Americans had renamed the displacement process as continental drift, conveying a more whimsical sense. They used the phrase as the title of a collection of papers presented at a symposium sponsored by an oil explorers’ organization. As continental drift, the derision was clear. 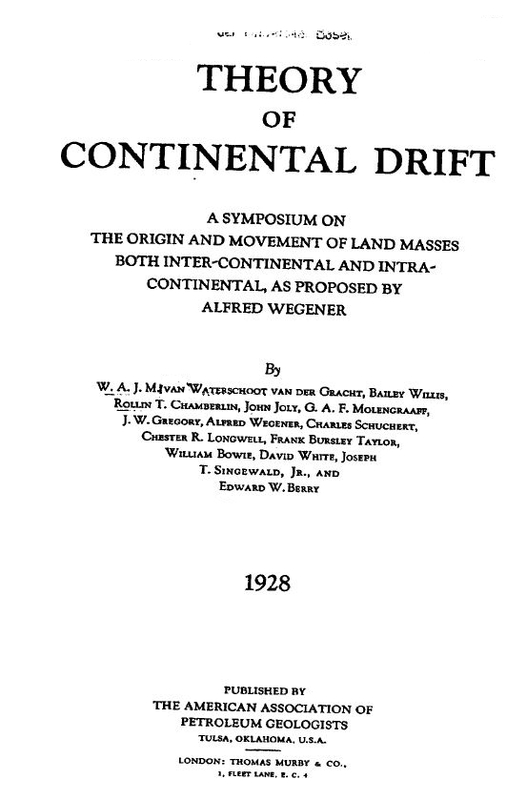 The American Association of Petroleum Geologists (AAPG) symposium seems to have been organized primarily to discredit Wegener and the few other proponents of his theory of displaced continents. The AAPG published the collected papers in a volume which has become a permanent record of the many New World scientists who rejected displacement and even engaged in personal attacks against Wegener. Twenty years after the AAPG conference in New York, continental drift was still generally rejected without discussion, said film producer David Attenborough. He attended a British university in the late-1940s. In a 2012 interview, Attenborough recalled asking one of his lecturers why continental drift wasn’t being discussed. He says, “I was told, sneeringly, that if I could prove there was a force that could move continents, then he might think about it. The idea was moonshine, I was informed.” Thirty years later, Attenborough presented some of that moonshine in his 1979 series, Life on Earth, demonstrating the evolution of life and planet. Dismissing continental drift theory as simplistic, Chester Longwell suggested that for advocates of the idea, “a definite choice of creed brings some peace of soul that is denied to the scientific skeptic.” It was not the last time Wegener’s theory would be described as a pseudo-scientific cult. But there may have been more to the disdain for Wegener’s theory. Rarely mentioned, but sometimes alluded to, is the fact that Wegener had been a German soldier. Americans such as his fierce critic Longwell had once had Wegener in their cross-hairs. Captain Longwell was a graduate student at Yale when the Great War broke out. He spent part of his two-year army service overseas where “his composure under unusual circumstances made all officers of the regiment admire and respect him.” The ugliness of the Great War cannot be overstated. During their advance into Belgium, Wegener was shot through the arm. After two weeks in hospital, he was sent back to the line and hit again – this time a bullet lodged in his neck. Finally, the directors of the German Army sent their great scientist off to work in the meteorological service. After the war, both sides sought cooperation in the sciences, but it did not help Wegener that his methodology displayed “cultural differences.” His theory languished on the edge of acceptability for years. Geologists saw no evidence that Greenland was trudging away from Europe at a rate of two or three metres per year, as Wegener had suggested. They argued continents are not strong enough to plow through ocean crust yet weak enough to buckle into mountains. And there was the lack of a strong force able move continents. The idea of mobile continents passed from a peculiar notion to a real scientific theory when Alfred Wegener suggested that scientists might be able to measure the pace of continental motion. This was a testable question for his hypothesis. Measurement would authenticate his theory, he said. Using old, but unreliable maps, Wegener estimated North America and Europe are separating at a rate of 250 centimetres each year. Wegener was wrong, the actual velocity is a hundred times slower. Wegener thought astronomical measurements would eventually become precise enough to measure the growing gap between Ireland and Newfoundland. He optimistically expected new techniques “will soon remove the last doubts about the reality of this movement.” But when newer data arrived a few years later, it neither confirmed nor denied continental drift. Wegener would not live long enough to see his theory proved. Measurements made in the 1980s finally confirmed his wild notion. Laser beams bounced between widely-separated pylons, charting continental drift. Recently, Earth-orbiting satellites have since marked the movement with a precision unimaginable in 1912. After Wegener’s death, a trio of scientists kept his drift theory simmering on the back burners of the science kitchen: Alexander du Toit, Arthur Holmes, and Reginald Daly. In future essays, I’ll give each of these scientists a voice. Tomorrow, we will look at Alfred Wegener’s immediate legacy and his last days, spent trying to help colleagues during a Greenland blizzard. This entry was posted in Biography, Culture, Geology, History, People and tagged Alfred Wegener, Bullard, continental drift, David Attenborough, Harold Jeffreys. Bookmark the permalink. I have always been an Arthur Holmes fan and we had copies of his Principles of Geology at high School in 1960-2. My geography teacher was taught by holmes at Imperial Coll London as he was a geologist.and mountaineer.Studying geology from 66-68 my first book was Holmes 2nd edition and I took continental drift for granted. and never made a conscious decision to accept it!! I studied geology at Oxford from 66-68 and the consensus was continental Drfit but were told that North Americans wouldn’t accept it – with a certain snideness. So I was Cont Drift all the way and never saw anything terribly new in Plate Tectonics 🙂 I then was in south Africa and came across Du Toit’s ideas. Many years later – 1990 my church organist was a Mrs Wegener who had married wegener’s nephew. Thank you for your interesting story and perspective. I am ten years younger than you, and was a child on a farm in Pennsylvania when I read a newspaper story about continental drift and how it looked like it might be real (around 1964) – my father laughed and said it was ridiculous! I appreciate all the background you have given about du Toit, Holmes, and Wegener’s family. Thank you for following this story and this blog! I remember being laughed at by our geography teacher when I suggested that Africa and South America were once connected. I was 15 at the time during the nineteen fifties. Later during the seventies when evidence started entering popular media, I felt supremely vindicated! You were precocious! It’s easy to see how hard it was for average people to accept the idea – our perception of the ground we stand upon denies drifting. Drift, just like roundness of the planet and motion around the sun, is contrary to common sense. Even into the ’80s there was a strong anti-drift movement. Today, there are still some bright scientists who refuse the idea (or parts of it) though with GPS measuring plate movement, it’s hard to deny. The ID crowd repeatedly cite Galileo as an example of an unfairly dismissed scientist. They never cite Wegener, who would, if they were right, be a much closer parallel. I wonder why. Unlike the British, the Germans had the wit not to send world class chemists into the firing line (compare the fates of Henry Moseley and Fritz Haber), but presumably they thought that Wegener wasn’t doing anything useful. Good points, especially regarding Galileo/Wegener and ID. Regarding the military, judging from Wegener’s personality, he probably volunteered for front line duty. 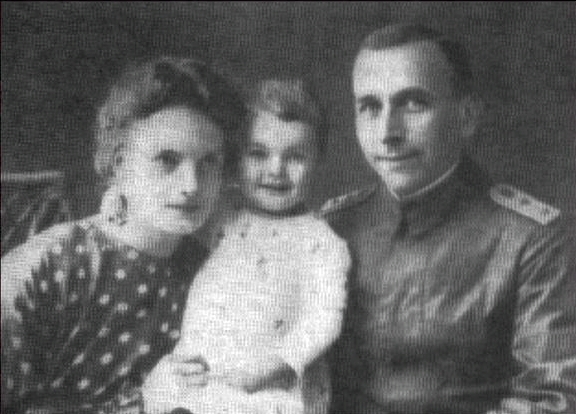 The war department should have refused him – he was 35 years old and was already working for the German government as a meteorologist, so it would have been easy to reassign him out of active duty. But they didn’t until he got his second bullet hole.